Details: SOLD OUT! Ever since winning the 2014 Telluride Bluegrass Festival Band Competition, Trout Steak Revival has quickly become a quintessential Colorado band. The band won an Emmy Award for a soundtrack they contributed to a Rocky Mountain PBS documentary. They’ve collaborated with school children in mentoring programs in Denver and Steamboat Springs. Their music is featured on Bank of Colorado’s radio and television advertisements. Most recently, Westword named them Denver’s Best Bluegrass Band, and they were nominated as a Momentum Band of the Year by the International Bluegrass Music Association. Join KAFM Community Radio in The Radio Room on Saturday, December 8th at 7:30 as we welcome Trout Steak Revival! The evening will feature easy traditional dances from countries all over the world, including Israel, Ireland, Bulgaria, French Canada, China, Italy, more...0 Greece, and England. The band Fifth Reel, with Connie Smith on piano, Norm Ashley on fiddle, and Mick Wilson on clarinet will provide live world music for the event. SOLD OUT! Ever since winning the 2014 Telluride Bluegrass Festival Band Competition, Trout Steak Revival has quickly become a quintessential more...0 Colorado band. The band won an Emmy Award for a soundtrack they contributed to a Rocky Mountain PBS documentary. They’ve collaborated with school children in mentoring programs in Denver and Steamboat Springs. Their music is featured on Bank of Colorado’s radio and television advertisements. Most recently, Westword named them Denver’s Best Bluegrass Band, and they were nominated as a Momentum Band of the Year by the International Bluegrass Music Association. Join KAFM Community Radio in The Radio Room on Saturday, December 8th at 7:30 as we welcome Trout Steak Revival! Tea, scones, mini-sandwiches, Victorian music and more will set the scene for this fun screening. 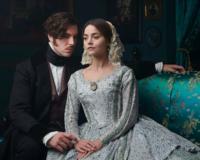 Immerse yourself into the world of Victoria, as we more...0 provide a sneak peak of the first hour of the first episode, returning to MASTERPIECE Theater for a third season. 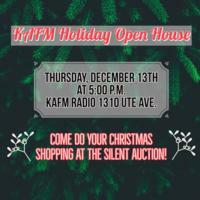 Visit KAFM Community Radio during our Holiday Open House & Silent Auction! Get some Christmas shopping done while supporting your favorite more...0 non-profit group with our silent auction full of exciting and unique items! Enjoy an evening of magic by David Wallen, appetizers, adult beverages, and great conversation! This is a daylong event put on by several groups in the Plateau Valley which is situated just east of Palisade. The craft fair has artisans who have more...0 handmade We have lots of homemade treats including fresh fruit pies, candies, cookies, fudge, whole wheat bread, etc. Hand mixed seasonings, jams, jellies and breads. Quilts, rugs, hats, scarves and baby items. Goat milk products, lotions and soaps. Local honey, pollen and honeycomb. Handmade Wooden toys and signs. Jewelry, candles, llama wool and woolen gifts. Leather items and ornaments. Plateau Valley is just east of Palisade off the I-70 exit for the Powderhorn Ski Resort. Then turn off for the 330 Highway.